Amber asked for some help accessorizing her living room. 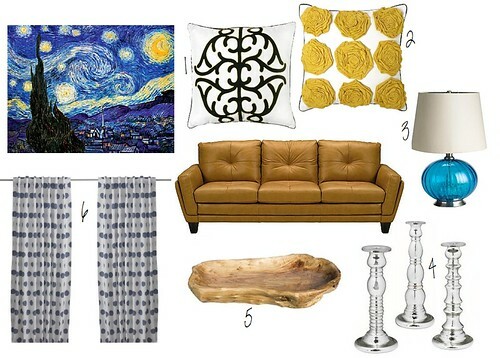 She and her husband just bought new leather sofas similar in color to the one shown in this room board, they also already own the "Starry Night" Van Gogh print. I thought the print was a great jumping off point to plan the rest of the room's accessories. Here's what I came up with. 1. First some pillows for the sofas. This pillow is from the DwellStudio line at Target, I love its graphic design. 2. This yellow rosette pillow is one of my favorites, the yellow ties in nicely with the yellow from the painting. The feminine roses also work as a juxtaposition to the bold graphic pillow. 3. I'm totally in love with the color of this turquoise lamp. It brings out the turquoise in the painting, whereas without the lamp you might not notice the turquoise coloring as much. 4. Every room needs a little shine, these inexpensive candle holders from Ikea come in three different sizes. 5. This carved wood tray would be great for holding TV remotes, and it brings some texture into the room. 6. Last but not least, some of my favorite curtains that Ikea carries. Again, the blue dot pattern plays off the blue in the painting. I loved that Amber already had an art piece picked out, it's a great example of my last post - choosing a color palette. This shows how you can simply look for accessories that carry the same color as your inspiration piece. But as you can see, I paid attention to some of the more subtle colors as well as picking items with different textures and patterns. The more obvious technique might have been to only choose plain yellow and navy blue items; which would have made the room much too matchy-matchy. Good luck Amber, I hope this inspires you! This is super cute Erica!